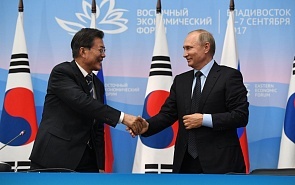 In 2013, South Korea government launched the Eurasian Initiative, aimed to speed up cooperation with Eurasian countries, including Russia. In spite of lip service and red tape during implementation of the initiative, it confirms a strong will of Republic of Korea to diversify traditional ‘maritime cooperation’ with the U.S. into a ‘continental cooperation’ with the Eurasian countries. Moreover, such a diversification even could involve the North Korea into mutually beneficial continental collaboration with new railways, energy transfer corridors, and trade exchange, providing basis for peace and prosperity of the entire region. Both South Korean and Russian economies are complimentary ones and seek a fertile source of growth. Therefore, there is an objective and common interest to cooperate with other. Which path should the countries take? What kind of future lies ahead the region? Here is Valdai Paper #76 by Lee Jae-Young, Vice President at the Korea Institute for International Economic Policy (KIEP), with a unique perspective from Seoul. While the North Korea crisis hangs over regional and global peace, the world calls out to constructive and peaceful cooperation that can halt the ‘conflict spiral’.